Kalgoorlie Boulder Community High School is located south of the township of Kalgoorlie. Three new teaching blocks were constructed to the northern portion of the site to replace two existing facilities, with a new Visual Arts & Education Support building to the south of the site. A new road entry from Hughes Street was provided along with new parking areas & playing courts as part of a forward works package. The project, when completed, will accommodate 1000 students at the school. Separable Portion One has recently been completed with Separable Portion Two currently underway. The design of the buildings utilised structural steel framing for the support of the roof and building fabric. As the buildings were essentially duplicated, careful consideration was carried out to simplify the structural details which also worked in with the Architectural requirement. 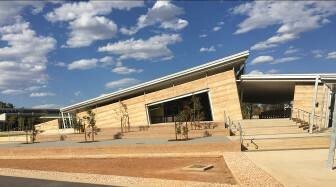 The use of featured Rammed Earth walls was used to exemplify the natural colours and ruggedness of the local area. Due to the ground conditions being mainly impervious, stormwater is typically conveyed via above ground flows. With the new building being positioned adjacent to the oval which is currently receiving stormwater off site, a cut off swale was designed to reduce the risk of inundating the building in a major event channeling the water to the council drainage system.